Paul Frederick Nehlen, III (born May 9, 1969), is a business entrepreneur from Delavan, Wisconsin, who ran unsuccessfully as a conservative against House Speaker Paul Ryan of Janesville in Wisconsin's 1st Congressional District in the Republican primary election held on August 9, 2016. On June 16, 2017, Nehlen announced that he will again challenge Ryan for re-nomination in the 2018 Republican primary. However, Ryan confirmed in April 2018 that he is retiring from Congress to "spend more time with his family." Nehlen holds several patents but has never won an election. He was born and reared in Ohio and has resided in Wisconsin since March 2014. He serves as senior vice president of operations for Neptune-Benson, Inc., a subsidiary of Evoqua Water Technologies, located in Beaver Dam, Wisconsin. In 2014, Nehlen founded from his residence a consulting business, Blue Skies Global LLC, from which he does pro bono work for mostly personal clients. The company's website stated that it provides consulting on "engineered products and projects" including cost control, logistics, and contract manufacturing. He is wed to Gabriela Nehlen and has two adult sons from a previous marriage. Nehlen's congressional platform called for secure borders, enforcement of existing immigration laws, and reduced government spending. He opposed to the Trans-Pacific Partnership Treaty. Despite the national attention focused on his campaign, Nehlen was overpowered by Ryan's $5 million war chest. Nehlen spent some of his own money in the primary. He was once a supporter of, and donor to, Ryan. “He's failed to put America’s security and American jobs first. I’ve had it. We’ve all had it. On April 26, 2016, Nehlen received the endorsement of the Tea Party Patriots, based in Atlanta, Georgia. In an August 2016 radio interview, Nehlen suggested that the United States should "have a discussion" about the possibility of deporting Sharia-law-adherent Muslims living in the country. Nehlen finished the race with just 14 percent of the primary vote. He also carried the endorsements of conservative icon Phyllis Schlafly, who died a month after the primary, columnist Ann Coulter, and Sarah Palin, the former governor of Alaska who was her party's vice-presidential nominee in 2008. After the congressional race, Nehlen assumed the chairmanship of a new political action committee backing Donald Trump in the November 8 presidential election against Hillary Rodham Clinton. Through the Citizens Revolt PAC, Nehlen pledged to speak nationwide and in the media to challenge Trump's intra-party critics, often known as NeverTrumpsters. Trump won the Wisconsin electoral vote by a narrow margin over the heavily favored Mrs. Clinton. In the 2017 special U.S. Senate election in Alabama, Nehlen came to the state to campaign for Judge Roy Moore, who was accused of sexual misconduct with teenaged girls more than forty years earlier. Nehlen said that Moore was "falsely accused" and derided liberal Republican figures, including Paul Ryan, for joining the campaign to defeat the former judge. Moore subsequently lost the race on December 12 by 21,000 votes to the liberal Democrat Doug Jones, a popular former U.S. Attorney in the Bill Clinton administration. In December 2017, after Nehlen issued several tweets judged anti-Semitic by his critics, Steve Bannon, the Breitbart executive and former aide to Trump, said that he is withdrawing all support for Nehlen in the primary. The Wisconsin Republican Party has condemned Nehlen's candidacy on the premise that his views "have no place in the party." 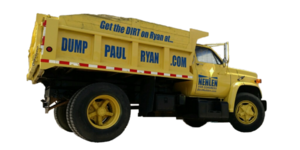 ↑ Businessman Paul Nehlen to challenge Paul Ryan from right in primary (29 March 2016). ↑ Paul Nehlen to challenge Ryan after losing by 68 points. usnews.com. Retrieved on June 16, 2017. ↑ Meet Paul Nehlen, the Business Executive Aiming to Knock Off Paul Ryan. ↑ Evoqua Acquires Neptune Benson Business, Leader in Water Filtration and Disinfection since 1956. ↑ Neptune Benson: Contact Us. Retrieved on August 10, 2016. ↑ Is Paul Ryan's Primary Opponent Really a Small Business Owner?. Retrieved on August 10, 2016. ↑ Ryan challenger has only consulted for free. Retrieved on August 10, 2016. ↑ about. Retrieved on July 12, 2016. ↑ Delavan businessman hopes to unseat Ryan. Journaltimes.com. Retrieved on April 11, 2016. ↑ Issues. Retrieved on July 10, 2016. ↑ Paul Ryan challenger Paul Nehlen endorsed by a tea party group..
↑ CNN, Tom LoBianco. Ryan challenger seeks debate on deporting all Muslims. ↑ Kelly Cohen (August 14, 2016). Bloodied — a lot — but unbowed, Ryan foe forms pro-Trump PAC. Washington Examiner. Retrieved on August 16, 2016. ↑ Nehlen to Ryan: "Judge Moore Was Falsely Accused, But You Are Guilty Of Spending Filthy Pedo Dollars". The Gateway Pundit (November 13, 2017). Retrieved on December 27, 2017. ↑ Steve Bannon cuts ties with far-right candidate trying to unseat Paul Ryan. The Guardian (December 27, 2017). Retrieved on December 27, 2017. This page was last modified on 3 April 2019, at 10:29.